Ideal to Monitor and Spy on Teenager PC Usage. Offline or Online, SpyAgent Will Record It! Here you will find common questions about our SpyAgent teenager spy software. 1. How do I start using SpyAgent? 2. How do I stop stealth mode? 3. Who has access to SpyAgent once monitoring? 4. Where are webmails logged and viewed from? 5. What operating systems does SpyAgent work on? 6. How come I am not receiving the email-delivery logs? 7. How do I know how long an application has been in use? 8. Why is my Windows folder gone after installing SpyAgent? 9. SpyAgent is in my Start Menu - How do I get rid of it? 10. I click on “Stop SpyAgent Stealth Mode” but nothing happens! 11. It seems SpyAgent is not logging my conversations, what's up? 12. SpyAgent says I need "riched20.dll" - where can I get this? 13. SpyAgent gives me an error with MSVCRT, MFC70 or MSVCR70.DLL? 14. SpyAgent gives me an error with SYSTEMSA32.DLL? 15. SpyAgent is in my Control Panel - how do I get rid of it? 16. Why is SpyAgent not logging my MSN chats? 17. Why is SpyAgent not logging my AIM chats? 18. Why is SpyAgent not logging my incoming/outgoing mails? 19. I have SpyAgent set to monitor all users, but it only monitors me? 20. I use the hotkey to access SpyAgent, but nothing happens? 21. Should I uninstall the trial version before installing the full version? 22. Some Spyware Detectors pick up and try to disable SpyAgent, help! Simply configure your options (click on the “Options” button) and then click the “Start Monitoring” button. Click “Stop Monitoring” to stop monitoring - your admin password will be needed each time. For a total stealth install you can also refer to our stealth install guide located here. Email us from our contact form with your order ID for stealth mode help. 3. Who has access to SpyAgent teenager spy software once monitoring? You are the only one that has access to SpyAgent once you install it - unless you give the SpyAgent password to someone else. This allows you to have exclusive access to SpyAgent's logs and options. Webmail activity will be logged in the keystrokes logs (outgoing typed webmails) and website content logs (incoming webmail). 5. What operating systems does SpyAgent work on?? 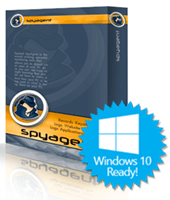 SpyAgent teenager spy software can be downloaded and purchased for Windows 200x, Windows NT, Windows XP, Windows Vista, and Windows 7! Make sure you use your ISP's SMTP host for SpyAgent's SMTP host, and use your ISP email address as the Send From and Send To fields in SpyAgent's Email Delivery setup. For example, if you are using MSN as your provider, you would use smtp.mail.msn.com as your SMTP host, with your msn.com email address as the send from/send to address! 4. Look for the 'mail exchanger' line that will appear - this is the SMTP host for your ISP. By viewing the Application Active Usage Log you can tell how long applications have been actively used by users - rather than how long they were just sitting in the background not being used at all. Your windows folder is only hidden now - you can view it by going to Folder Options in explorer and enabling the 'view hidden files' option. If you are on Win98 with IE4+ installed you can simply right click on the SpyAgent folder in the start menu and delete it. You can also right click on the Start button, select Explore - then navigate through the Programs folder to Spytech SpyAgent - then just delete this folder! The start menu listing can also be removed by using the 'Stealth Actions' menu within SpyAgent teenager monitor software. If you click on this and nothing happens, that means SpyAgent is not running in stealth mode. It may be in active mode, but it is not in stealth mode. To bring up the main SpyAgent screen, click on the SpyAgent icon in the task bar (by the time/date). Make sure both 'log all windows used' and 'log all AIM/MSN/ICQ/Yahoo' options are enabled. You can download this file HERE. Place it it in your windows\system folder. 13. SpyAgent gives me an error with MSVCRT.DLL, MFC70.DLL, or MSVCR70.DLL? You can install these missing system files by running the installer we have created found HERE. Reinstalling SpyAgent will fix this problem. Please make sure you disable any antispyware/antivirus software when installing. You can remove SpyAgent teenager monitoring software from the Add/Remove Programs Control Panel either by using the 'Remove from Control Panel' feature in the SpyAgent's options menu, or by choosing not to include an installer while installing SpyAgent. Make sure you are using the latest version of SpyAgent teenager spy software - which logs all MSN Messenger conversations (including versions 6.0 and up). Also please ensure you are using the US-English version of MSN Messenger. You are most likely using an AIM add-on. These add-ons often interfere with how SpyAgent teenager spy software records AIM conversations and will render SpyAgent's AIM logging useless. To work around this either uninstall the AIM add-on software, or use ScreenSpy and key logger features. First, make sure you have the email logging option turned on in SpyAgent's logging options. Second, if you are on dialup this feature will not operate - it is only usable by users with 'always-on' internet connections (ie: dsl, cable, network connections). Third, make sure you are using POP3/SMTP emails - webmail (like Hotmail) is not logged by the email logging feature in SpyAgent (webmail is logged separately, in the website content logs). This is probably happening because the log location you are using for SpyAgent's log storage is not set to full read/write access for all users of your computer. Make sure the log location has full access for all users - and also make sure you have 'load on Windows startup for all users' enabled in SpyAgent's startup options. To set a folder to full read/write access in Windows XP right click on the folder, click on "Properties", then "Security" within the properties window. Once there, make sure all users and groups have full read/write access set. SpyAgent teenager spy software is probably not running. Double click the SpyAgent icon in its installation folder to restart it. Be sure to click 'Start Monitoring' again next time you stop monitoring, to ensure it stays running. If you exit the software, it will no longer be monitoring. Yes, you should remove the trial version first before installing the full version to ensure there are no conflicts between the two versions, and that the two copies are not running simultaneously on your computer. Good news! This can be prevented. Make sure you have 'Disable Spyware Detectors' enabled in SpyAgent's Security settings (click on the advanced tab on SpyAgent's user interface). If this does not do the trick make sure you have SpyAgent's latest Spyware Detectors Database installed. To do this simply run the update installer located HERE. Realtime-Spy receives many acclaimed reviews. Top Five Advisor called us the best monitoring software! See their SpyAgent Review.